Framagraphic is pleased to present the work of three talented Kitsilano Secondary students in our gallery. These young artists were given the challenge to take a piece of artwork from Framagraphic’s collection, and incorporate it into their own way of art-making. The original artworks by Joanne Issac, Coar, and Brian Mason, were the starting points. The students invested both their time and their newly developing skills into the project. From drawing on top of the originals, to cutting and collaging the artwork, each student has taken a different approach as to how to how to use what other artists have left behind. When I was younger I went to the UBC Museum of Anthropology and saw something that completely shocked me. A group of Tibetan monks were working on a beautiful mandala with soft, colourful sands. Once it was finished, the fragile art was carried outside, and was blown out of sight by the wind. It was meant to show that nothing can last forever, and that we have to learn to let go of “things”. As a young child, that moment was engraved in my head as something both beautiful and strange, yet I did not fully understand its purpose. When I saw the painting of the colourful vase dressed in gold and silver lines, I was once again reminded of the Tibetan mandala, and the idea of letting go. I thought of how everyone is obsessed with clutching onto their physical possessions, of afraid of losing their “things”. Over the years, I’ve finally began to understand the point that the monks wanted to give out, and through this project, I wanted to continue carrying out the message. The girl in my artwork is the image of ourselves, anxiously grabbing onto the beautiful vase that symbolizes our belongings. Holding onto materials only make us greedy and paranoid, as “things” don’t last forever. I wanted to warn people not to become slaves of their materials. I was mainly inspired by Michaelangelo’s painting while making this artwork. The two butterflies represent the old and young men from the painting. 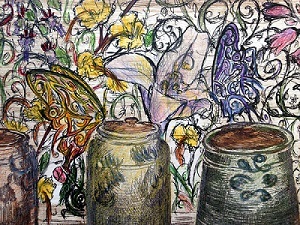 I chose to draw butterflies because the jars make me thing of the containers with sample insects in them. As I was working with this piece, I noticed that the original print uses mostly grayish colours. Therefore, I decided to use the colors of rainbow to make the picture livelier and more three-dimensional, colouring the six jars using red, orange, yellow, green, blue and purple sequentially. I drew lots of vines curving and crossing one another to decorate the background, creating a forest-like kind of theme. Instead of coloring all the leaves and vines with the same green, I decided to use different kinds of green to portray the four different seasons. The most obvious ones are probably the autumn leaves, which are on the right side of the picture, and the winter leaves that are on the left side. I put a lily flower in the middle to not only create a focal point, but also avoid making this picture too complicated. However, the biggest reason that I put the lily in the middle is to make others able to recognize the connection of this picture to Michaelangelo’s painting. On August 31, 2012, my sister Saoirse was killed by a driver who veered off the road and struck her as she was walking safely along the shoulder of the road in Sudbury, Ontario. Saoirse was on her way home to us having completed a trek across Canada. My mom and I spoke to her just 4 minutes before she was hit. This was Saoirse’s first time away from home. She was 20 years old. When I saw this print originally titled ‘Hidden Doors’, I was inspired by its sombre colouring, the architecture and the image of the doors as hiding something. I see death as a life event that is hidden behind people’s fear and discomfort. Sometimes death comes to us after a life fully lived. Sometimes it is a door that opens far too early.